My toothache is still bugging me! But thank goodness for this really cool ice pack from Grey's Anatomy! I've been using the ice pack to numb my pain and I have to say it works really great. Either that or I'm just so into Grey's Anatomy that my mind actually makes me believe my toothache somewhat subsides after each use! So today I'm feeling a little better from my ice-pack session but if the toothache persists, I know the inevitable will follow and you will see me whining about having to go to the dentist next! It's not that I'm a baby when it comes to dentists, but the idea of having to go through any form of pain is just depressing, know what I mean? 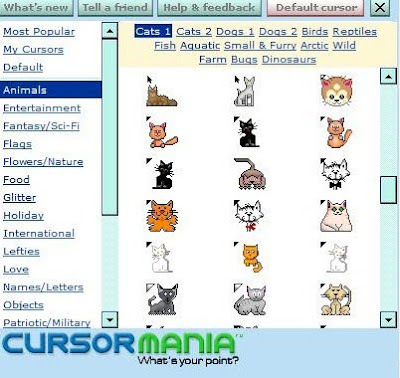 Anyway if you missed out my cool cursor post at my main blog, here's a reminder to let you know of a great program called Cursor Mania. This cool program allows you to install a small easy-to-download Runescape Cursors app in your Toolbar, which lets you switch from one cursor to the next with just one click. I find it very entertaining and I use it to suit my daily mood, which of course changes from one to the next too! There are so many categories to choose from but today I'm in the mood for some cat love, so here we go. So many adorable meows to choose from and they're all MINE! Have fun with the cursors too if you like. They're FREE and this particular app doesn't seem to slow down my system, so I think it's really cool! wah! i want that ice pack.. heheh.. esp with the one with MerDer!!! hope your toothache goes away soon GP.. i hate dentist too!! :* :* :* :* LJ Meow 2! I agree!!! So many changes grrr! >:o >:o >:o >:o GG Meow 3! studying GP!dunno if can chop later..2 exams tomo. i'm doin good GG! and u? love this post as continuation with ur other post.lol..
Yeap Mon.. now it’s like that..
Those are such cute cursers. And our Mom is a huge fan of Grey's Anatomy too. So we know that ice pack will work. Hope you feel better soon. Olla Marzie.. harap gigi sudah semakin baik. Dah cuba sensodyne ka? Rizal kalau sakit gigi memang guna sensodyne je.